"I Am Not Fluffy," by Liza Cody, in Ellery Queen's Mystery Magazine, December 2013. There's a lot going on in this one. It takes a while to piece the story together and understand the way the narrator is telling it. So, who is she (besides not being Fluffy, I mean)? I worked as a hostess and greeter at a bar-restaurant six nights a week for five years while Harvey qualified to be a tax lawyer. And for two nights a week Harvey was going round to Alicia's flat to bounce her bones. "you were never there," he complained. "What was I supposed to do all by myself every night?" What indeed. Insult to injury: Alicia was an old friend of hers. And now that Harvey is making a bundle he wants a no-fault divorce and a big white wedding to his new love. Our narrator goes for textbook passive-aggressive tactics: refusing to sign the divorce papers. She can't afford a lawyer on her hostess salary so she changes to a less respectable but more remunerative profession. And she begins writing her protests against the world around her in chalk on the sidewalk, signing them Fluffy. Is this a story about a nervous breakdown? A split personality? Or is our heroine learning to not be Fluffy anymore, to be a person who can take care of herself? "Othello Revised," by Denise Middlebrooks, in Ellery Queen's Mystery Magazine, December 2013. One big problem with little stories is they don't leave much room for us critics to pontificate and display our wisdom. Last week I talked about my philosophy concerning flash fiction. This week we aren't dealing with a flash, but definitely a short tale. And it is one I like a lot. In fact, I probably care for it more than most people would, for two reasons. First, I find myself in a circumstance not too far removed from the protagonist, and second, the story, Middlebrooks' first, reminds me of a certain piece by James Thurber, one of my heroes. The narrator has just written a mystery novel and his wife recommends he takes it to a professional editor. The editor turns out to be an interesting person, a real estate agent who reinvented herself in the recession, and she has some fascinating suggestions about the book. Or what she thinks is the book. And there we have to stop. Go read the story. It's November and you deserve a treat. "Acknowledgments," by Christopher Coake, in Kwik Krimes, edited by Otto Penzler, Thomas and Mercer, 2013. 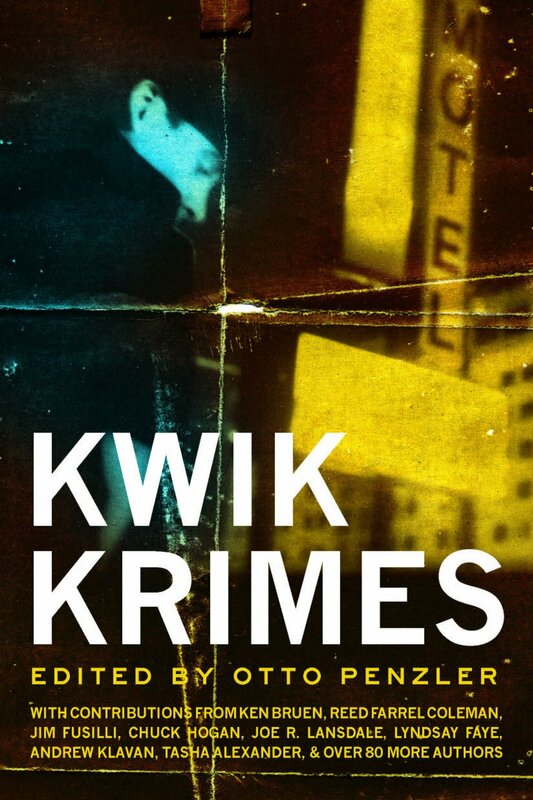 Kwik Krimes is a collection of flash fiction, mysteries under 1000 words long. I have written before about flash stories and concluded that there are basically three categories: outline, anecdote, and other. The outline is generally the least satisfactory. It attempts to cram into onto a postcard a plot that really needed more room to grow. The anecdote tends to work better; one little slice of life (or in the case of this book, often a slice of death). By the other I mean something bizarre, often something that would be painful at greater length but uniquely fits the little niche of the flash. Take for example, Mr. Coake's contribution, which immediately made me think: why didn't I think of that? Margaret, my wife. You were this story's subject, its reason for being. I think, by the end, you understood me at last. Other stories I like a lot in the part I have read so far include stories by Chuck Caruso and Bill Crider, as well as tales from friends of mine, Gary Alexander and Jo Dereske. I believe in full disclosure, which in the case of this blog means that you deserve to know if I might have some reason to favor a story other than its quality. In this case it is a triple threat. Not only is Janice Law a friend of mine, and a fellow blogger at SleuthSayers, but I can also claim a tiny bit of credit for this story existing at all. I was the one who suggested to Janice that she do something she had never done before: write more than one story about a character. I think this is the fourth in this series, although I might be off. And what a wonderful character she is. Madame Selina is a spiritualist in New York City in the years after the Civil War, when quite a number of people long to speak to their dead loved ones. Madame is assisted by Aurelius, the former emperor of Rome who allegedly speaks to her in trances, and by Nip Tompkins, formerly of the orphan's home, who assists with clouds of smoke and other special effects when the emperor proves unreliable. "The mind needs little helps," explains Madame Selina. And by hook or by crook she will provide them, and catch the bad guy in the process.